Every chef should have a signature dish, and for Blue Iguana’s Manuel Castillo, it’s his molcajete (pronounced mohl-kah-HEH-tay). The native of Durango in northwestern Mexico was taught to cook by his paternal grandmother, and he used her training as a foundation when starting as a prep cook at Salt Lake’s “other” Iguana (the red one). The Cardenas family once owned both the Red and Blue Iguana before selling the downtown Blue Iguana to Kris Cappaert 20 years ago. That’s also when Castillo joined the “blue” team and came aboard as executive chef. 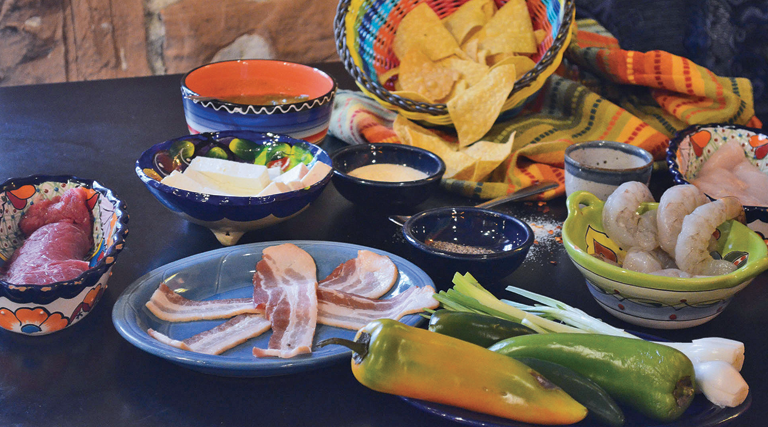 While more and more Mexican restaurants offer a molcajete (named after the oversize heated volcanic rock mortar and pestle in which it is served), Chef Castillo’s dish features his own special touches. 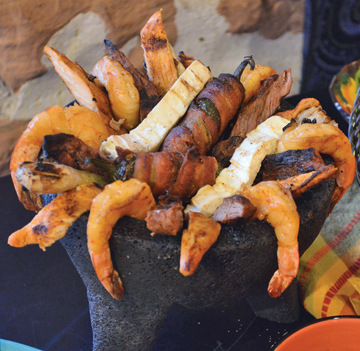 Overflowing with strips of grilled marinated chicken and steak, plump prawns, bacon-and-cheese-wrapped peppers, spring onions and queso panela cheese, the molcajete’s base is filled with a tangy tomatillo and nopales (cactus leaves) sauce. A strip of tender meat, cheese or prawns with a spoonful of sauce on a warm tortilla is the very definition of heaven. The dish, at $31.95, is designed to be shared, so find some compadres and take time to savor the multi-faceted flavors, spices and textures along with a bottle of Blue Iguana’s private-label wine.